Totsukuni no Shoujo is a popular fantasy manga that draws the story of a girl and her nonhuman friend. 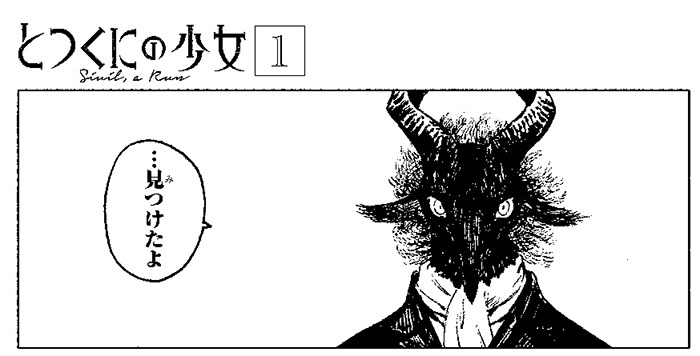 The unique art style makes this black & white work different from every other manga or illustrated book. You can spot it in several book stores all over Japan, and until now it has drawn a lot of attention. 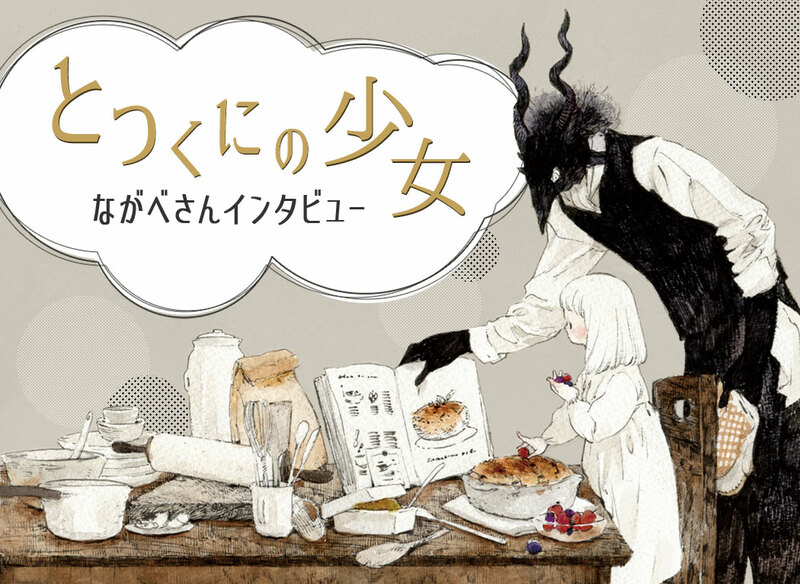 Today we interviewed the author, Nagabe, who will tell us something more about Totsukuni no Shoujo which, by the way, you can also read on pixiv Comic. In the first half of the article you can read about the world he created, the challenges that he had to face and the story behind his characters. In the second half, Nagabe will introduce us to his favorite materials and techniques, including his old felt tip pens, that apparently are his go-to tool. 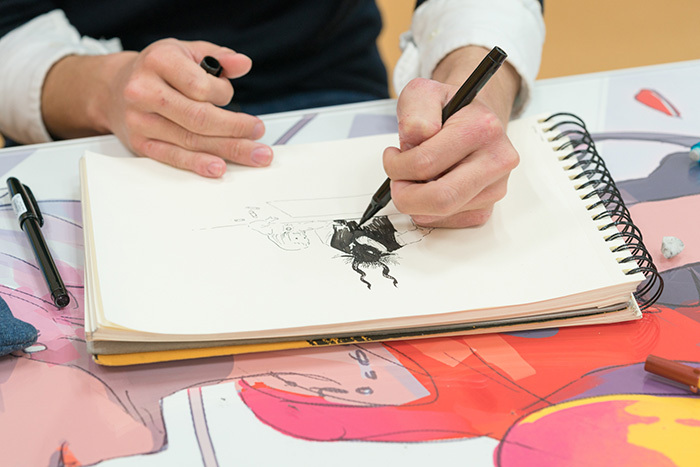 He will show us some of his illustrations and you'll be able to see a making-of video of Shiva and her guardian Sense. - In your manga Totsukuni no Shoujo the theme is the exchange between human and nonhuman characters. What brought you to draw a nonhuman character? When I was little, I really liked to draw and I used to trace and copy the characters I liked the most. I began designing my own characters during junior high school, and I feel my kemonomimi characters (with cat or dog ears) had quite a lot of influence on my decision to draw nonhuman figures. I just thought they were cute. - You really liked animals! I really do, I like all animals - especially those with distinctive traits and characteristics. Take a deer, for example. It has a very recognizable silhouette and its shape is a lot of fun to draw. - In other words, you think animals are interesting even from an artistic point of view. Yeah, the main reason why I love animals is because of their appearance. The second reason may be connected to Totsukuni no Shoujo, and it's the fact that they're not as versatile as humans. From a human point of view, animals are almost pathetic: they can't speak, the lack of opposable thumbs make their paws clumsy and so on. However, if you compare animals to humans, this patheticness makes their good qualities stand out even more, hence making the animal world extremely fascinating. 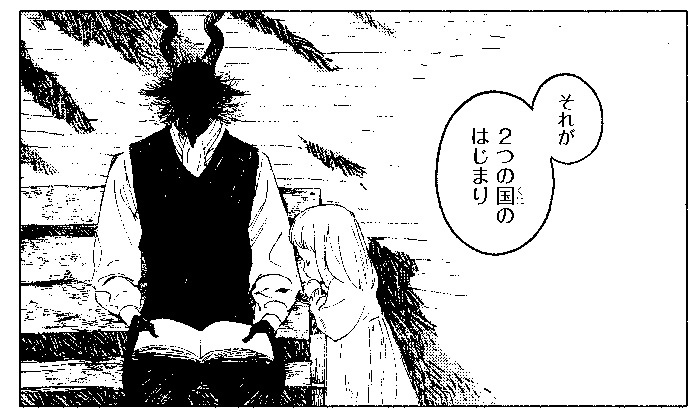 - Totsukuni no Shoujo's character Sense has horns, too. What animal is it based on? Sense's distinctive traits are its horns. In contrast to the heroine Shiva, black is its main color. - Were you influenced by any artist? Oh yes. And not just one or two, I'm influenced by many artist at the same time - I collected different elements which I thought would go well with my style. Recently I really like Tove Janson, author of the Moomin series, and Komako Sakai's The Velveteen Rabbit. I'm very much influenced by Sakai's austere style. - What's the reason behind taking inspiration from so many artists at once? I think if you focus on just one or two artists, then you end up drawing exactly like them. People will think "I already saw this somewhere..." That's why I think it's better to take as much inspiration as you can from many different artists, taking specific points of their art style that match with your personality and combine them all together to create something with unique colors. 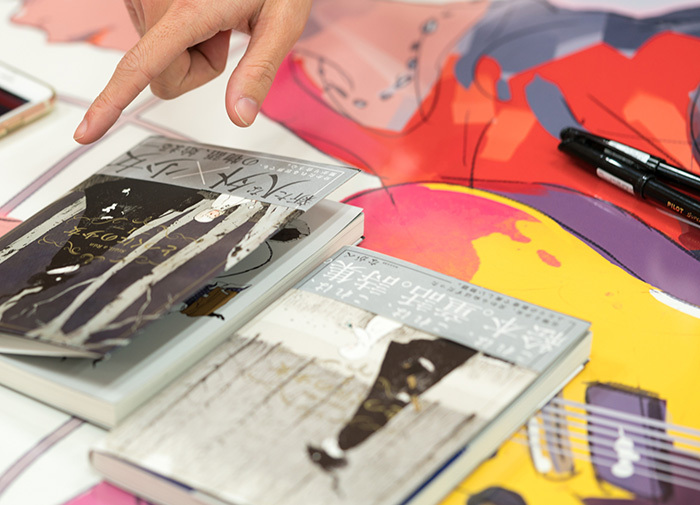 Totsukuni no Shoujo's theme is "gentleness"
- What made you want to become a mangaka? It all began when I started posting illustrations on pixiv. At that time you couldn't publish manga yet, so I started posting Buchou wa Onee in the form of illustrations. The publishing company Akaneshinsha saw it and sent me a mail offering me a job as a mangaka. - How did you feel when you read the e-mail? I instantly thought "I want to do this!". However, and those who read Buchou wa Onee probably know what I'm talking about, the protagonist is a cross-dressing beefy dragon... I wondered if that kind of contents would go well with a commercial magazine. (laughs) They answered my concerns by saying that it was indeed an unexplored field but they liked the challenge... And that's how I became a mangaka. - What's the difference between publishing manga for fun and publishing manga on a magazine? Well, when writing for a magazine there are other people involved. I became extremely aware of the fact that you can't be as selfish as you were when you were publishing manga as a hobby. Also, before working for a magazine I didn't draw any backgrounds... It took a while to get used to it. - Who would have thought! It was really hard... (laughs) After my debut, I had to think about a way to draw backgrounds, learn how to collect resources and materials and accept to be open to genres which are not my own. I have a feeling that I'm finally starting to grasp the whole background thing. - After polishing your professional skills with Buchou wa Onee, you also published Nivaua to Saito (Futabasha) and Totsukuni no Shoujo. How did you come up with the story for Totsukuni no Shoujo? The most important theme behind Totsukuni no Shoujo is gentleness. From the gentleness of the artwork itself, to Sense's intent to protect the heroin Shiva, the kindness of their actions and so on, I wanted to paint "gentleness" in a multitude of ways. Also, I came up with the concept of "not touching". Physical contact is a common way of communicating, not unlike words, but I wanted to reflect on how Shiva and Sense would communicate if they were prevented from physically touching. After deciding on this limitation, I thought about the story. That's how chapters 1 to 6 were born. In chapter 1, Shiva asks Sense if she can touch him, but he responds that she will be cursed if she does. - Can you make an example of how the two communicate? In chapter 6, Sense has to protect Shiva against an inner entity - however, he can't do it in the traditional way. Instead, he hurts the entity so it would go away. I really wanted to portray how the characters would behave under the constraint of "not touching", even if it wasn't easy. - I see. First came the concept of "not touching", and everything else came after. How did you come up with the idea of dividing the world into two lands, inner and outer? I thought "why can't the two of them touch? ", and the answer was "otherwise she will be cursed". From this concept, I built a world where curses exist and everything around it, established the setting and decided which kind of characters lived in it. However, I tried to exclude elements that could remind of the real world as much as possible. After all, the theme behind this manga is what's most important. There was no need for extra things. What I came up with eventually was the setting for an inner land and an outer land. In chapter 3, Sense teaches Shiva about the origin of the two lands, born from the Gods of black and white. - There's a strong duality in your work: between the inner and outer land, black and white, human and nonhuman. Can you tell us about it? Actually, I didn't overthink it. I wanted to make the setting easier to understand through contrast. Also, I wanted to avoid proper nouns. That's why I'm using simple vocabulary words, such as black, white, in, out, which clearly indicate the difference between characters. - Was it hard to come up with the characters? Not at all. Actually, it was rather fun. Both Shiva and Sense were born from the idea of a pure white character and a pure black character. For Sense, I wanted an eerie character who could be easily distinguished through his silhouette. Originally I wanted to publish Totsukuni no Shoujo as a doujinshi, and ever since I uploaded the first character illustrations on Twitter I never changed my mind about them. - You said the characters remained the same, but did the story change since the start of the serialization? - Totsukuni no Shoujo sold more than 100k copies. What do you think of your fans' reaction? Next Page : His go-to tool is... a convenience store pen! ?